Does your young Mozart need an outlet beyond Rock Band? The Downtown Interschool Orchestra is now holding open auditions for school aged children to join this season. Founded in 1972, the InterSchool Orchestra is a non-profit organization that has become New York’s premier orchestral performance and training program fro young musicians ranging from 6-20 years old. 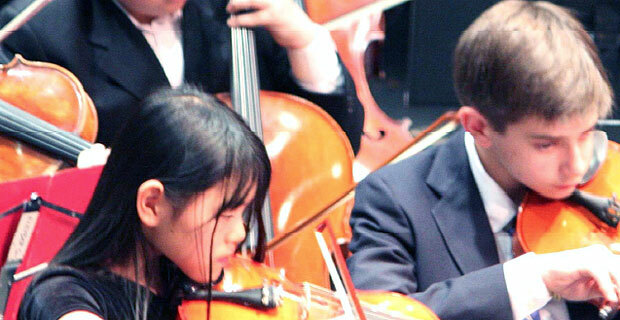 This years Downtown Interschool Orchestra will be conducted by James Blachly. Nearly 300 students citywide participate in the program which holds 30 performances annually in some of New York’s esteemed concert halls. Although there is a cost to join, no child is turned away for financial reasons and scholarship opportunities exist. If you are interested in enrolling your child in this premier program, auditions are held before every weekly rehearsal through October. Those who are interested in auditioning should reach out to Gary Tigner. Rehearsals are held Mondays from 4:45-5:45 at Trinity Wall Street in the Choir Room. To find out more about the Interschool Orchestra check out their website.